Moving from People magazine to publicists' offices to tours of stars' homes, Joshua Gamson investigates the larger-than-life terrain of American celebrity culture. 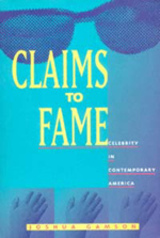 In the first major academic work since the early 1940s to seriously analyze the meaning of fame in American life, Gamson begins with the often-heard criticisms that today's heroes have been replaced by pseudoheroes, that notoriety has become detached from merit. He draws on literary and sociological theory, as well as interviews with celebrity-industry workers, to untangle the paradoxical nature of an American popular culture that is both obsessively invested in glamour and fantasy yet also aware of celebrity's transparency and commercialism. Gamson examines the contemporary "dream machine" that publicists, tabloid newspapers, journalists, and TV interviewers use to create semi-fictional icons. He finds that celebrity watchers, for whom spotting celebrities becomes a spectator sport akin to watching football or fireworks, glean their own rewards in a game that turns as often on playing with inauthenticity as on identifying with stars. Gamson also looks at the "celebritization" of politics and the complex questions it poses regarding image and reality. He makes clear that to understand American public culture, we must understand that strange, ubiquitous phenomenon, celebrity. Joshua Gamson is Assistant Professor of Sociology at Yale University.